RDF has worked on several projects in Sierra Leone since 2009. Currently, RDF is implementing one project with the National Mineral Agency. Since 2009, RDF has supported government institutions in Sierra Leone to record over US$135 million in government revenues. The Mining Cadastre Administration Support project was launched in 2009 and the fourth phase was launched in October 2015. The German government, through GIZ currenty funds the project. Prevous phases of the project were funded by the European Commission, UNDP, and RDF. RDF has worked with the National Mineral Agency (NMA) to strengthen the agency’s management and governance of the mining license process. Through the project, the NMA has streamlined the entire licensing process to make it efficient and more accountable with a goal to increase mining investment in the country. In 2014-2015, the key focus was placed on process export shipment data (specifically export of iron ore) and royalties payments through the MCAS system. Further support to regional offices was also implemented, including the introduction of hand-held devices for compliance monitoring, capacity building and sensitization. The newly launched fourth phase has a specific focus on artisanal mineral rights and inspection with minerals analysis of large-scale exports, in ensure correct royalty payments. The Online Repository continues to be a beacon of innovation in terms of government transparency, publishing all mining and forestry licenses and related payments for public consumption. The portal now has over 4,000 registered users. RDF supported the government in implementing a new payment system for non-tax revenue that integrates with the MCAS system (see section above). Non-tax revenue is government revenue in the form of fees for services provided. This was an area that has been stressed repeatedly by the Auditor General as requiring urgent improvement in accountability. A link between the Revenue Authority and the National Mineral Agency has been established and, as a result, all orders to pay are received electronically and payments are recorded in the Non-Tax Revenue System (NTRS) digitally. The NTRS system receives electronic orders to pay issued in the MCAS system and records payments following the revenue code classification of the National Revenue Authority. When a payment has been made an electronic confirmation is given back to the MCAS system. The forestry project was initiated in January 2012 at the request of the Government of Sierra Leone’s Ministry of Agriculture, Forestry and Food security, and is funded by the European Union (EU) Food and Agriculture Organization (FAO) FLEGT Program. It was completed in July 2015. The aim of the project was to strengthen the management and governance of the forestry rights and permits process. FRAS was introduced to the head office and, as part of its second phase in 2014, the FRAS system was implemented at the Kenema District Forest Office. The Kenema office was selected to be the pilot project as it is the most revenue generating regional office. The checkpoint at Bandama was also selected to train and support District Forest Officers. RDF has developed an Urban Administration System for supporting local governments in low-income countries to improve efficiency and accountability in revenue and tax collection. The lightweight, user-friendly system allows governments to manage property tax and business license data, with the associated revenue streams. RDF’s main property tax project has been in collaboration with Bo City Council, with its origins as early as 2009. The largest phase was funded by the International Fund for Agricultural Development (IFAD) in 2012 and was completed in 2014. The RD Urban Tax Administration System has been successfully installed, which allows for the administration of both property tax and business licenses. It has been reported that the system greatly reduced discretionary power exercised by tax collectors, and thus decreased corruption and increased trust. The City Council has increased tax revenue base significantly and have contributed to improved public services such as transport and waste management. The Online Repository portal publish data directly from MCAS at the National Minerals Agency, and makes the entire mining license registry available online for investors and the public. 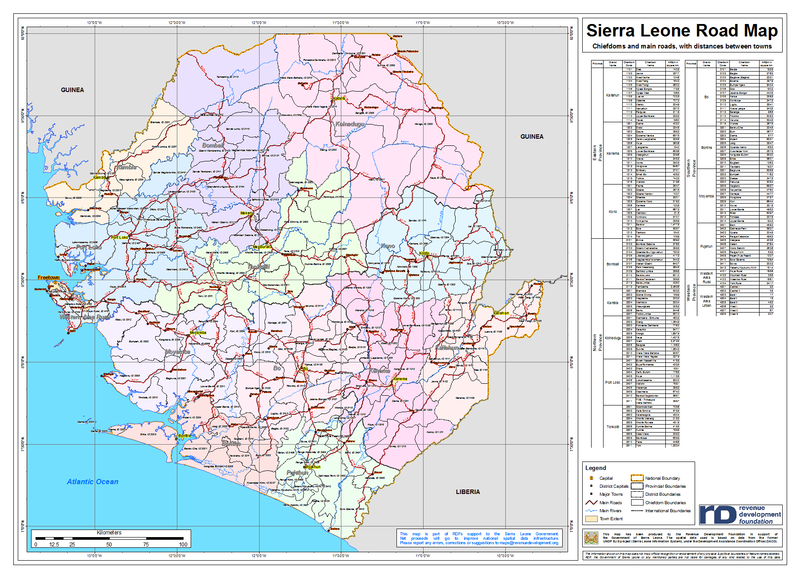 The Sierra Leone Planning Maps are based on original maps made in 2005 under a project by the United Nations Development Programme (UNDP). The household survey data from the last population census in 2005 by Statistics Sierra Leone forms the basis for all the settlements and public facilities, while an enormous amount of efforts to digitize natural features from satelite maps have provided the location of rivers, roads and population centres. These maps have been combined and refined by RDF over the years and represents the most accurate and detailed maps available to the country. Base map showing all political boundaries, major roads, rivers and settlements. Detailed district map with all settlements, schools, health clinics, roads and distances between major towns. Download the excel file with the list of all 21,000 settlements, schools and health clinics in the country.